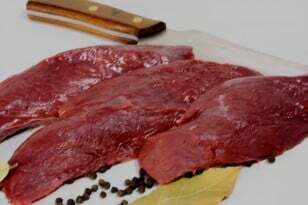 Venison, kangaroo and wallaby compared to domesticated animals are low in fat, high in iron and zinc, and a good source of protein, vitamins and minerals. Tasmanian fallow deer is held in high esteem for its eating quality and is the ideal product to try for that next dinner party when looking for something just that little bit different. The rich ruby red colour, moist texture and very low fat nature of the meat lends itself to flash roasting, quick grilling or pan frying and the forequarter cuts are superb when marinated in red wine, garlic and root vegetables overnight before long slow simmering to extract the maximum flavour. Bennett's wallaby which is wild shot in the central highlands and processed by Doo Town Game Meats at Eaglehawk Neck is a milder tasting meat than kangaroo with a delicate flavour. Combines well with some of our Australian bush tucker type flavourings like lemon myrtle and native pepper.